This 25 in. 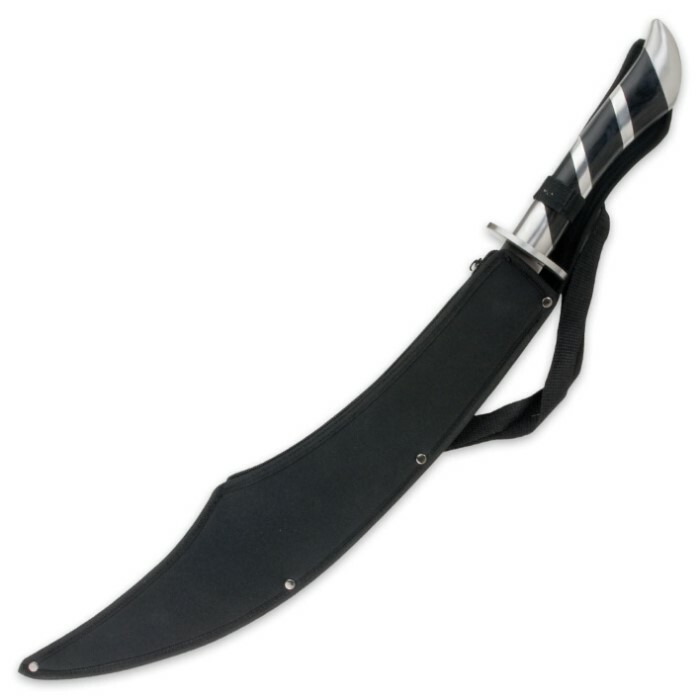 half-tang fantasy sword has a 17 1/2 in. stainless steel blade with a wood handle and stainless steel guard for a smooth and easy grip. Includes nylon sheath 25 in. overall. 17 1/2 in. blade. Got mine as an early xmas gift. Everything the description and reviews said and more. Needle tip and came sharp enough to shave my arm out of the box. Not a toy its a real sword. Battle ready!!! At the price i wouldn't hesitate. You get bang for your buck. Thanks bud k for a quality blade. My first purchase from budk! I love this sword, nice and sharp feels good in hand! its rare to get stainless that is this sharp, sword looks good has good weight and balance. Its a winner at an unbelievably low low price. If you're considering buying this scimitar hesitate no more. Buy it! This just arrived and close inspection reveals a heavy weapon well made. This is not a blade for children. 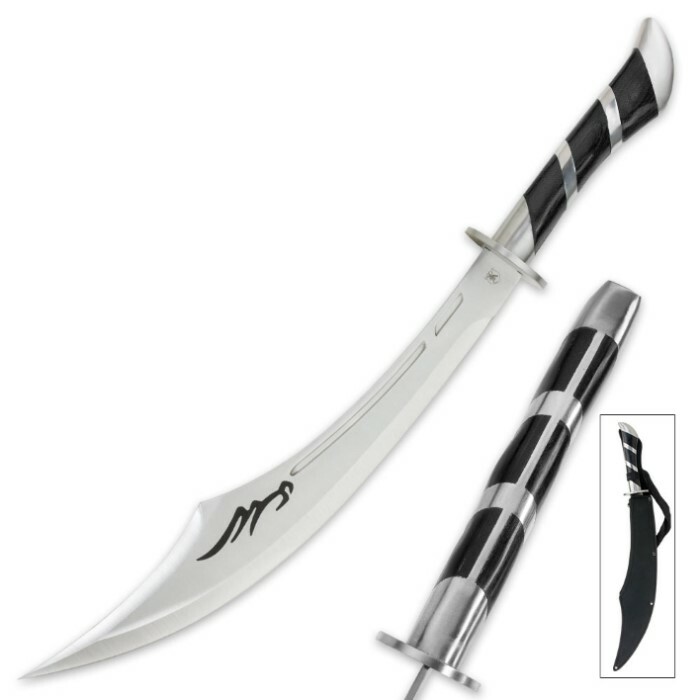 The handle is large and solid, the blade sharp and it can do some serious damage. It also looks great and will be on display. So glad I purchased one. Sturdy. Heavy. Well balanced. Fits hand well. It is just insane! Fairly sharp. Well made. Swings as an extension of your hand. Great grip. The sheath... not perfect, but not the worst. This is not a toy! The blade is fully sharpened, tempered, and full tang. The handle is metal with a dark wood. The sheath is nylon with a strap, and has a zipper to unsheathe the blade. The looks are stunning, and give it an authentic look. This is a must have! Wow it"s beautiful, nice weight. Simply wow!